While Paul had run the Grandin Court Baptist 5K before, this was a first for me. Grandin Court Baptist offers free child care - complete with a bouncy house - for parents who are running the race. This allowed Paul and I to run the race together. The race started on a downhill on pavement for a little over a mile, and it went by fast. I passed the first mile in 7:13. Not long after that, we headed into the woods, on trail. The trail was well marked, but there were some stairs involved early on and they were tough! After the stairs things smoothed out on the trails and I felt light as I jumped roots and went around corners. I was second female at this point, but third was right on my tail. After I came off the trail, she passed me just before we got back on pavement, putting me in third. This is where things got hairy, because fourth place was then right on my tail. I wanted to hang on to third, so I pushed really hard. The finish is on a very long gradual up hill, and the lady in 4th had a person biking next to her, coaching her on. He was saying, "Just 30 seconds left at this sign, push hard, you can take her, you can do anything for 30 seconds!" Believe me, I dug deep at this point to try to hold on to third. I dug so deep that I was hoping I wouldn't end up tossing my breakfast at the finish line. Luckily, I managed to hold on to my stomach and my 3rd place. I finished 4 seconds behind Paul (one of these days I'm going to take him! ), and 2 seconds behind second place. The girl behind me finished 2 seconds behind me. My time was slower than usual for a 5K due to the trail portion, but I was happy with it - 24:36. We dragged the kids away from the bouncy house so they could participate in some events themselves. Cort and Reid did the toddler trot. They just stood there after 'GO!' so Paul had to grab hands and lure them along. It was maybe half a mile total, and Pierce did well even when he got tired on the uphill at the end. He didn't complain, just slowed down a bit. 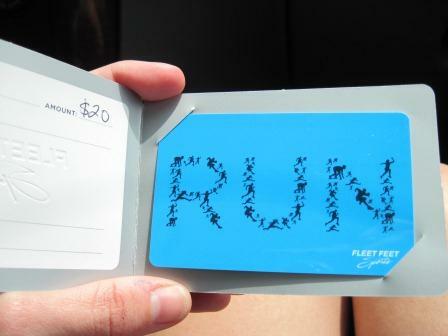 My prize for 3rd place wasn't a trophy this time, but a $20 gift card to a local running store. How cool is that?! 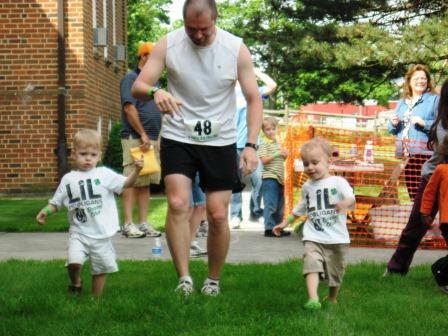 Pretty sure we'll be doing this race again in the future - it was a lot of fun for our entire family. Overall, May turned out to be a great month for fitness. Total miles = 107. Free weights x 9. Ab/Core work x 8. Hiking x 5. I also ran a 10K this month (thanks so much to my parents for babysitting!) and was able to break the 50 minute barrier again finally. I've been chasing after that for a while now. 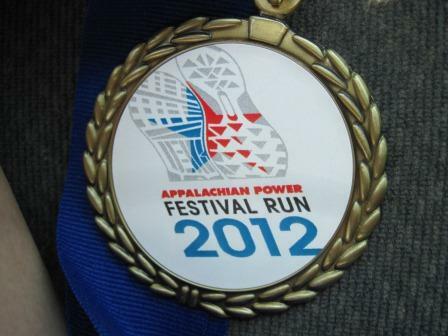 It wasn't a PR, but I was happy with my time of 49:51 and placed 1st in my age group (and 9th female overall). Hopefully June will bring more fun running adventures! Way to go, Lisa! This sounded like a really great race. I love that they had childcare so Paul could join you. Looks like the boys had a blast. Congrats to YOU! and a great event for a family to participate in together, you two are terrific parents. This sounds like a great event! How wonderful that they had things for kids to do. Yay fam!! I can't run, but I do walk every day. Of course, DH walks circles around me, but that's ok. Congrats for placing to all of y'all! Paul may be slowed down looking over his shoulder for you to pass. You go, girl! Weren't you complaining a few years ago that you're SLOW??? What was up with that? Way to go! Congrats on holding on to the 3rd place even with someone breathing down your neck. 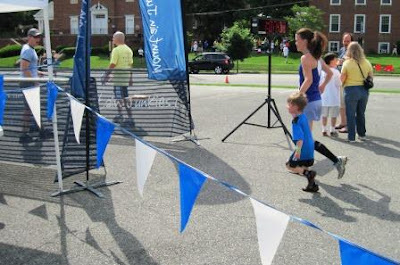 Sounds like running might become a family affair. 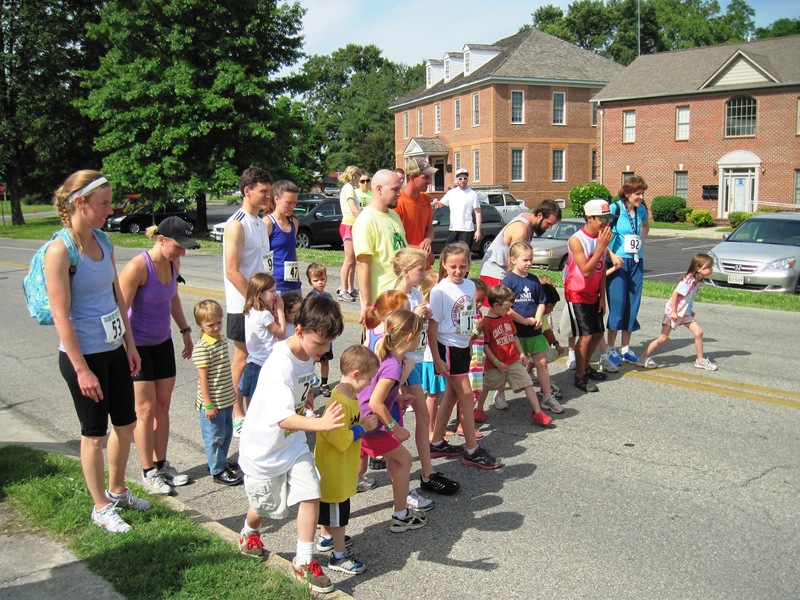 You'll have to try the Giblet Jog 5K one year--I mention it in my post today. Congrats!! That looks like a great family event too! WAY to go! Sounds like it was a tight finish indeed. Congratulations!! Do you know what you will get at the store? That is a very cool prize! So Paul was second and you were third? Well, laugh if you want, but exactly how long IS a K??? I even asked someone who was running in one (my daughter-in-law) and SHE didn't know! The boys look so sweet in these pictures. Glad you didn't throw up!!! Ones who throw up should get a special award for toughing it out till they barf. Such fun for the entire family! Way to go on your third place! Have fun spending the prize! Glad the boys had fun also. I was hanging on to every word hoping you'd keep that 3rd spot! Whooo Hooooo Lisa!! Way to go. That is a much better prize than a trophy that you have to dust. Way to go, Lisa. I enjoyed these pictures so much. A great way to involve the entire family. Congrats on the gift certificate - let us know what you purchase! Congratulations on third! What an accomplishment! Congrats! A gift card is so much better than a trophy! Lisa, I nominated you for the Illuminating Blogger Award. The award website is http://foodstoriesblog.com/illuminating-blogger-award/ and my post on the award is at http://bringingalongocd.blogspot.com/2012/06/illuminating-blogger-award.html. Congratulations--you deserve it! We have been having computer problems so not getting around very good it seems! My husband ran for over thirty years until he was injured at work and to quit. That was before we met so I never got to accompanied him to a race. Reading your post today gave me a hint at what that would have been like. Congrats on the cash prize. Always better to be able to go shopping over dusting a trophy. Reminds me of the first fun run my daughter and I joined... We had a blast! Great that the coordinators provide daycare! You must be in great physical shape. Kudos! Siempre estupendas las fotos que nos dejas. How fun and inspiring! I love this! That's too funny that they just stood there after 'GO'! What a fun adventure for y'all! That is great that they offer childcare! Makes for a fun, fit family outing. Great job, Lisa!! And, what an awesome prize!! I love it! I love that they have daycare and then the kids get a chance to run.